I don't currently have the dough to buy one, of course, but when has that ever stopped me from pining over a gaming delicacy such as this? I'm bringing all of this up, by the way, because Internet retailer NCSX started taking pre-orders for these beauties a few days ago. How much will you have to drop to get your hands on one? Oh, only $399.90--give or take a few pennies. I know the following thought is a pipe dream, but here's hoping the powers that be at Nintendo find it in their hearts to bring these suckers to other regions at some point. I've been pining away over this one ever since it was first announced, Bryan! I just love the forest design! And the black and gold color scheme... Gorgeous! I really can't bring myself to buy another LE Japanese 3DS (my husband would kill me, for one), but I'm definitely in the same boat as you regarding the pipe dream of hopefully seeing this get a release outside Japan someday. 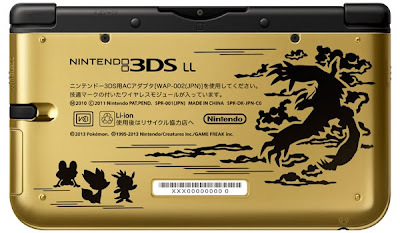 As things stand, I'm still considering getting an AU 3DS due to region-locking, anyway, so if they DID release this over here, that would definitely push me over the edge! Honestly, I wasn't so enamored with it at first. I think it was the gold/black color scheme, which normally isn't my "thing." I think I also was a bit turned off by the design on the top lid, which I probably thought was a bit busy. Now, though? I love it. The design on the top lid especially. Like I said on Twitter earlier today, it's sort of magical, isn't it? Almost like something Disney would make. I really can't imagine I'll get one, although I am pondering it (if I can somehow find the money)--mainly because I really want a Japanese LL/XL. As much as I love my misty pink OG 3DS, its screens really are too small. Once you've gone LL/XL, you can't go back! My, my, my. This is perfect. The legendary I love is on the front, and the ugly on is on the back. It's great! Oh, but I love the X one and don't care much for the generic-looking Y one. 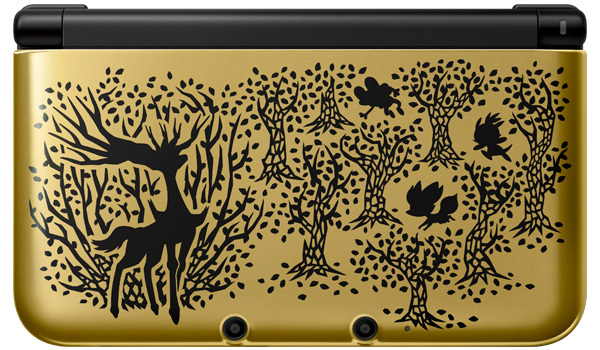 But isn't the deer/stag one the X legendary and the, uh, other thing the Y legendary? Or is it the other way around?